So many of comics most iconic heroes are so old at this point, items from their genesis are hard to come by. So when H.G. 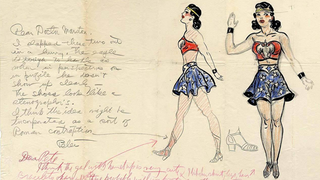 Peter's first sketch for William Marston's new female superheroine Wonder Woman goes to auction, it's a rare glimpse into the history of one of the most iconic female superheroes ever. UPDATE 4/16: It has since come to light the auction for this piece is old news — very old news, in fact. Comic Link auctioned the sketch 9 years ago for $75,000. Bleeding Cool, where this news was sourced from, has since edited their original article (without comment) to clarify that the piece is not currently up for auction. We'll be leaving our post as it was originally below, but with this update to reflect the error. We apologise for the mistake, and would like to thank Women You Should Know for letting us know what was up. The piece was recently recovered from Peter's estate, the original artist for the character when she made her début in December 1942's All Star Comics #8. Peter's initial sketch idea isn't far off from Wonder Woman's final costume — she would swap her sandals out for boots (the basis of which you can already see added into the sketch), receive a slightly more plain belt, and have her top cover her midriff rather than leave it exposed. It's hard not to think about giving the 70+ years of changes Wonder Woman's gone through, but it's kind of amazing how right Peter got it on his initial sketch, creating a design that would become an icon of comic books for years. The letter is being auctioned on Comic Link for an as yet undisclosed price. You can find more information about it on their website.